While preparing for my son's birthday party in June, I wanted to find recipes that I could make in advance to cut back on the amount of time the day of the party. 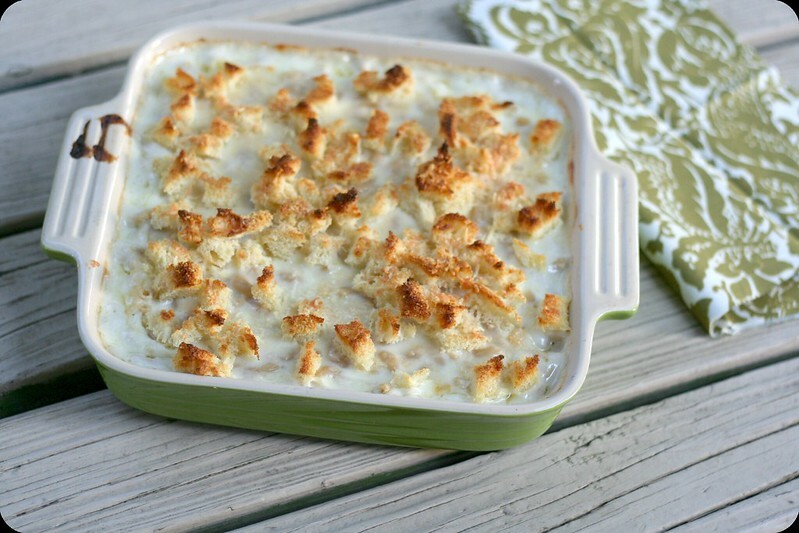 Searching for a fabulous Macaroni and Cheese recipe that could be frozen I came across this recipe on Smitten Kitchen. I generally glance through comments, but I was reading these fully, and came across a few that froze it with good success. This recipe feeds 12, so I intially tried a half batch. Six servings is still big for 2 and a half people eating it (Ty was still just starting table foods at the time), I actually made 2 quarter batches essentially! One I baked immediately, and another I froze for a week, thawed overnight and baked a few minutes longer than the "fresh" pasta. The fresh macaroni was fantastic. Out of this world amazing, and I immediately declared it my new favorite, go-to baked macaroni and cheese dish. Because it was that good, I was afraid of what the next week would yield, but I was very happy to bite in to another delicious dish! While there were a few small differences, nothing that would sway me away from making this recipe to freeze. I ended up making this recipe for Ty's birthday party and it was a huge success. I'm so glad it froze well, because with 50 people I needed to make a few! Preheat oven to 375 degrees. Butter a 3-qt. casserole dish; set aside. Place the bread in a medium bowl. In a small saucepan over medium heat, melt 2 tablespoons butter. Pour the melted butter into the bowl with the bread and toss. Set the bread aside. While whisking, slowly pour warmed milk a little at a time to keep the mixture smooth. Continue cooking, whisking constantly, until the mixture bubbles and becomes thick, 8 to 12 minutes. Remove the pan from the heat. Stir in salt, nutmeg, black pepper, cayenne pepper, 3 cups cheddar cheese, and 1 cup Pecorino Romano cheese. Set the cheese sauce aside. Cover a large pot of salted water, and bring to a boil. Cook the pasta until the outside is cooked and the inside is underdone, about 3 minutes. Transfer the macaroni to a colander, rinse under cold running water, and drain well. Stir the pasta into the reserved cheese sauce. Pour the mixture into the prepared dish. Sprinkle the remaining 1 1/2 cups cheddar and 1/4 cup Pecorino Romano, and the bread over the top. Bake until golden brown, about 30 - 40 minutes. Transfer the dish to a wire rack for 5 minutes; serve.